Home » Clinical Trial » Crizotinib (Xalkori) approved for ROS1-positive NSCLC! 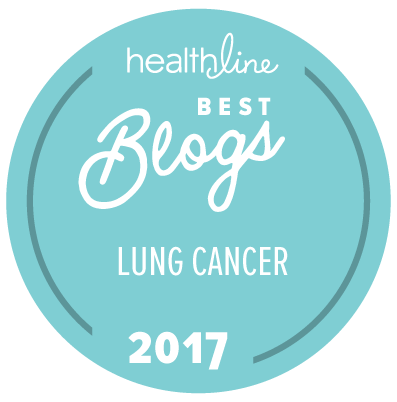 Crizotinib (Xalkori) approved for ROS1-positive NSCLC! The anticancer pill I take in my clinical trial, Xalkori (generic name crizotinib), was approved today by the FDA for my type of lung cancer: ROS1-positive non-small cell lung cancer. I’m one of the 50 patients whose results were included in the clinical trial data. In addition to being happy that I found an effective treatment for my lung cancer–I’ve had No Evidence of Disease for 36 months and counting–I feel proud to be part of the research that is making new cancer treatments available for more patients. Precision medicine, targeted therapies, and clinical trials are awesome. Some people have asked what this approval means to my participation in the clinical trial. Nothing has changed for me. I’m still in the clinical trial, and I still get my drug free (but have to pay for my travel). Last April, Xalkori for ROS1+ NSCLC received “breakthrough” FDA designation, which is one type of accelerated FDA approval. The accelerated approval process allows the FDA to grant approval before a Phase 3 clinical trial is completed, but still requires a Phase 3 trial to be completed eventually. So my clinical trial must continue until the Phase 3 trial is complete, or the FDA will pull its approval of Xalkori for ROS1 NSCLC. Xalkori originally received breakthrough designation for ALK+ NSCLC, and was granted FDA approval through the accelerated process in August 2011 (the fastest drug approval to date). The Xalkori for ALK+ NSCLC phase 3 clinical trial still continues over four years later. So I suspect my clinical trial will be continuing for some time. However, even if I left the clinical trial, Xalkori is already covered by most insurance plans, and today’s FDA approval means pretty much all plans will cover it. However, the copays vary considerably. Some plans cover it as a pharmacy benefit with a substantial out of pocket expense. Others cover it as a medical expense, with a standard deductible. I haven’t checked to see how (or if) my plan covers it. I plan to stay in the clinical trial at the University of Colorado for the forseeable future. I like having regular access to some of the top experts in the world on ROS1 cancer and molecular testing for precision medicine. My writing income goes to fund their Lung Cancer Colorado Fund for lung cancer research. I also participate in their research as a patient advocate on the NCI-sponsored CU lung cancer SPORE (Specialized Program for Research Excellence) and get to learn about cutting-edge cancer research, which satisfies the geek in me. Besides, I’ve grown fond of several people I’ve come to know at CU. It’s become a second home of sorts. So, yeah, this approval does not change my treatment. But hopefully it will make the treatment more available to more patients ASAP. This entry was posted in Clinical Trial, Lung Cancer, Precision Medicine, Research, Science, The Bright Side and tagged Crizotinib, FDA approval, ROS1, Xalkori. Bookmark the permalink. That’s wonderful, Janet. Time to celebrate! So happy for you! Thank you for being a Guinea pig for this trial! I am thrilled to know this medicine has been approved! Peace and blessings to you and all the other warriors out there! Great news for all ROS persons! More access to a great drug. And thanks for all you do Janet and for your pioneering advocacy. May you have a long run on Xalkori. I am at 23 months and counting! This is such good news for all ROS1 folks. You have benefited from stepping up to be a clinical trial participant, and so will many other people. I’m not surprised that you are sticking with the trial.